Joshua Tree NP sounds less familiar than its bigger brothers, such as the famous Grand Canyon. Unless you are a U2 fan… The band has called one of his best-know albums to this particular tree and the scenery over there was perfect for their album cover. 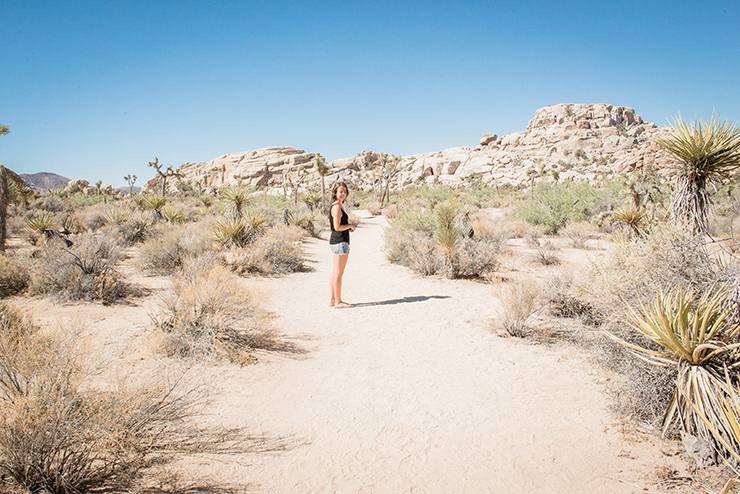 For us, Joshua Tree NP was a big surprise. We didn’t know what to expect in advance but after seeing wonderful pictures on Pinterest we could not resist a visit. Besides that it was an ideal stopover on our way from Laughlin to Malibu. We have spent one night in this desert. You can’t compare this park to Yosemite or Zion where the views are just breathtaking. But the quietness you find here definitely tastes morish! The dramatic and unique Joshua Trees (which you can only find in the Mojave Desert) characterize the landscape and make a trip by car through the park definitely worth it! As the park is less known to the large crowd you can immediately park your car near the start of every hike and you don’t have to reserve your camping spot months in advance. In summer you can camp on first come basis, which makes a spontaneous visit possible! Don’t be afraid of extreme heat, it is certainly doable as the temperature drops as soon as the sun goes down. However, keep in mind that the facilities are not the same as the ones you’ll find in larger parks, so come prepared. As you are staying in the desert there is no water and showers. But you can fill your shower bag at the beginning of the park at the visitor centre. 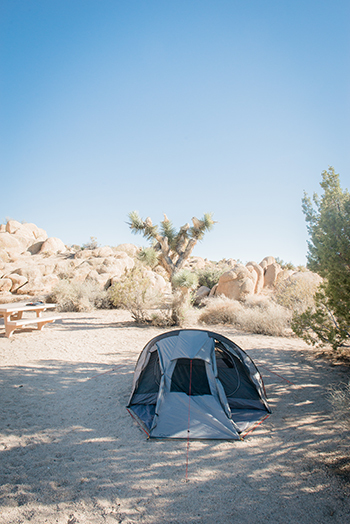 The best experience in the park is to camp next to – of course – a Joshua Tree. The campsites are one of the most beautiful we’ve seen during our stay. If you have the opportunity, plan your visit when it is half moon. That way you can enjoy a breathtaking sky as soon as it gets dark. What concerns the hikes, we became more and more picky after seeing some of nature’s most dazzling and precious creations (Cloud’s Rest, Angel’s Landing, South Kaibab, etc.). However we still enjoyed the hike up Ryan Mountain. The other hikes in the park were, in our opinion, less challenging and not that impressive. The hike up to Ryan Mountain is the hardest one in the park, but still not that difficult and doable with kids if you start early in the morning (to avoid the midday heat). You will be rewarded with a beautiful view over the park. But as mentioned earlier, the park is ideal to cross by car. If you leave early enough in the morning the chances are that you run into some desert foxes. They look incredibly cute and are very curious. Furthermore, we encourage you to enjoy the peace and the quiet you will find in this park and you will miss in some other national parks during the summer months. And of course, stop as many times you want to get your perfect U2 cover taken. The park is not really a must-do if your time is limited, but if you’re on the way to LA, we definitely recommend at least stopping over and enjoying this unique landscape.